Island Zero is written by the popular novelist Tess Gerritsen (Gravity), and is the directorial debut of Josh Gerritsen (her son, I assume). The indie was lensed in Maine, utilizing local cast and crew. 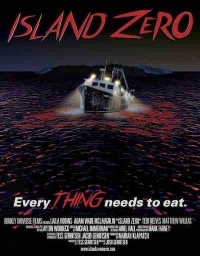 Island Zero stars Laila Robins (Planes, Trains, and Automobiles), Adam Wade McLaughlin (Showtime's "Billions"), Teri Reeves (ABC's "Once Upon A Time"), and Matthew Wilkas (Fits and Starts). Inhabitants of a fishing island off the coast of Maine find themselves mysteriously cut off from the outside world after the ferry suddenly stops coming. All the phones have gone dead and every boat sent to the mainland fails to return. When dead bodies turn up along the water's edge, the hardy band of survivors must find out who, or what, is killing them. Island Zero lands May 15, 2018.